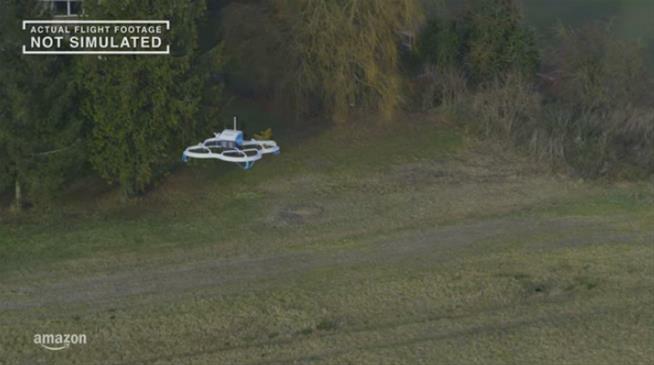 (P1) Amazon has made its first delivery by drone. The inaugural “Amazon Prime Air” delivery took place last week but was just reported by the company Wednesday. The long-anticipated air delivery took just 13 minutes, CNET reports. Amazon’s goal for Prime Air is for deliveries to take 30 minutes or less. A customer in England ordered an Amazon Fire TV stick and a bag of popcorn, and a GPS-guided drone dropped it off in his backyard. TechCrunch calls it “a major step for Prime Air, which looked like little more than an early April Fools’ joke when Amazon first announced” it. (P2) The private UK beta program, which allows for deliveries of certain items during daylight hours as long as weather permits, is so far serving just two customers, but will eventually expand to dozens and then hundreds more in the Cambridge area, Ars Technica reports. In the US, however, drone deliveries are essentially banned for now, since FAA regulations require a drone operator to be able to see the drone while it’s flying. As Fortune points out, there are other hurdles, including the fact that drones can so far carry packages weighing only up to five pounds, and can only deliver to customers within a relatively small area around a fulfillment center. Why do you think Amazon wants to use drones to make deliveries? Do you think Amazon’s idea will succeed or fail? Why? Do you prefer to shop online or physically in stores? Why? What the name of the delivery service by drone? Amazon’s aim is to deliver packages by drone in 30 minutes or __________. How much weight can a drone handle to make deliveries?